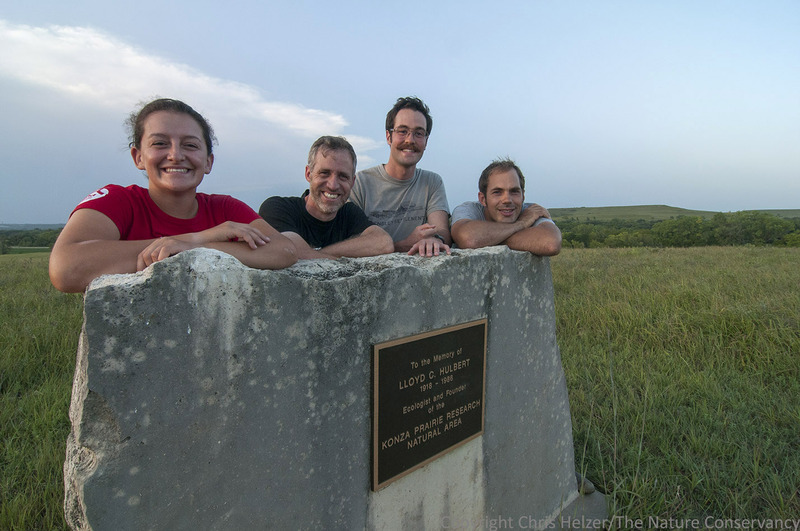 Last week, several of us from the Platte River Prairies traveled south to visit the Konza Prairie Biological Station near Manhattan Kansas. Konza Prairie includes about 8,600 acres of prairie, jointly owned by Kansas State University and The Nature Conservancy. The prairie is managed and used as a biological station by Kansas State University’s Division of Biology, but hosts research projects from scientists around the world. 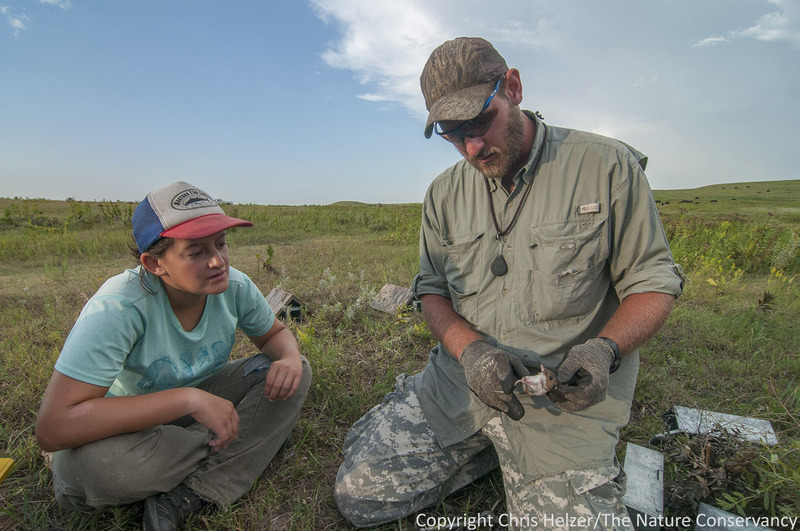 The biological station has a three-fold mission: long-term ecological research, education, and prairie conservation. 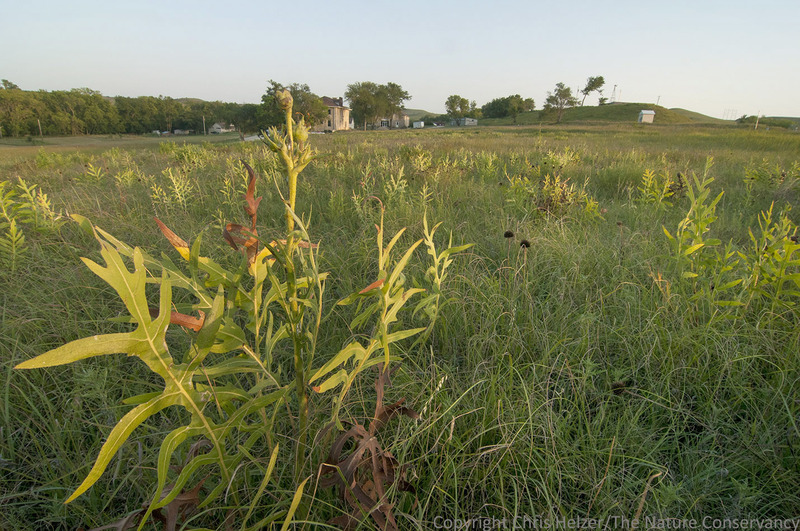 Research results from Konza Prairie have been very influential for grassland managers across the world, but particularly in western tallgrass and mixed grass prairies of North America. Over the next couple of weeks, I’m going to report on several topics we discussed with researchers at Konza during our trip. Today, I’ll just give you an overview of the site and our visit. Annually-burned prairie near the headquarters of Konza Prairie near Manhattan, Kansas. It has been very dry there since early summer, so much of the vegetation – including compass plant – is shorter than usual. We had two main reasons for our trip to Konza. First, our two Hubbard Fellows, Jasmine and Dillon, are designing research projects on small mammals and grasshoppers, respectively, and wanted to learn from Kansas State researchers on those topics. 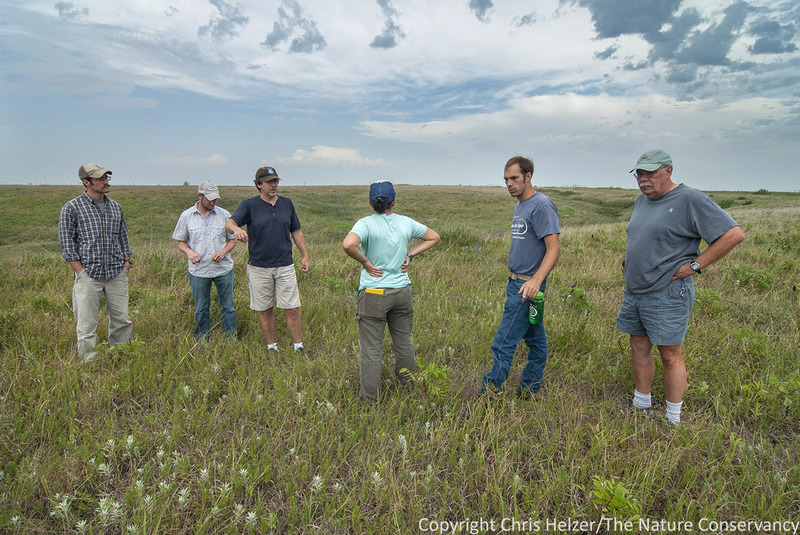 Second, researchers from Konza Prairie have produced some of the most important grassland science there is, and we wanted to learn as much as we could by touring the site with some of those researchers. Our Nebraska crew in Kansas. From left: Jasmine Cutter, Chris Helzer, Dillon Blankenship, and Nelson Winkel. Thursday evening, we arrived just in time to take a short hike near the headquarters as the sun was going down. Then we went to bed early so we could get up before the sun Friday morning and accompany researcher Drew Ricketts as he checked his small mammal trap line. Drew is comparing the small mammal communities between patch-burn grazed prairie (with cattle), annually burned/grazed prairie, and ungrazed prairie burned every four years. Jasmine wanted to see his trapping and handling techniques and get some tips on identifying some of the species. Checking small mammal traps at sunrise. Jasmine (left) watches as Drew Ricketts explains how to identify a white-footed mouse. 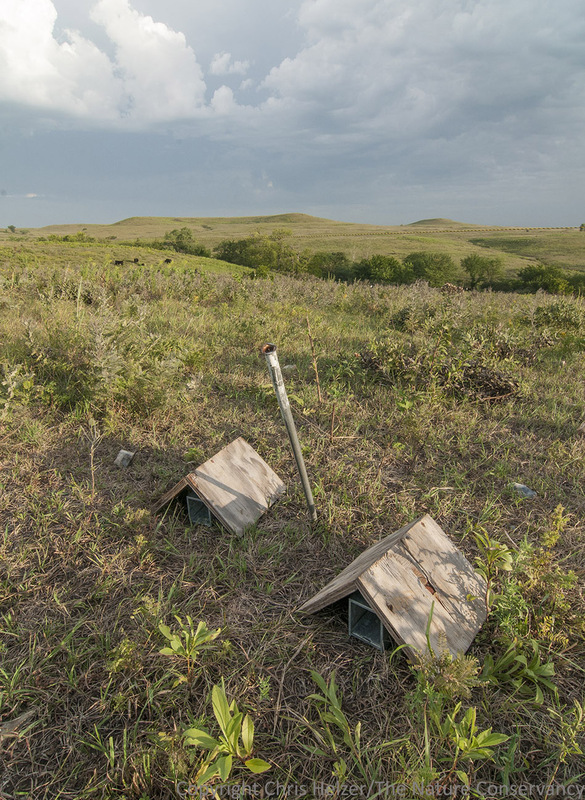 Sherman live traps laid out in a grazed portion of the prairie. The crew watches Drew and his assistant, Kyle (right) examine and record data from captured small mammals. Patch-burn grazing was being used in a portion of Konza prairie. These cattle were grazing in the most recently burned patch, creating habitat of short grass and tall forbs (wildflowers). Ungrazed forbs in this photo includes leadplant and purple prairie clover. Research has shown higher diversity of many invertebrate and other animal groups in this kind of habitat than in more uniformly short or tall grassland habitat. 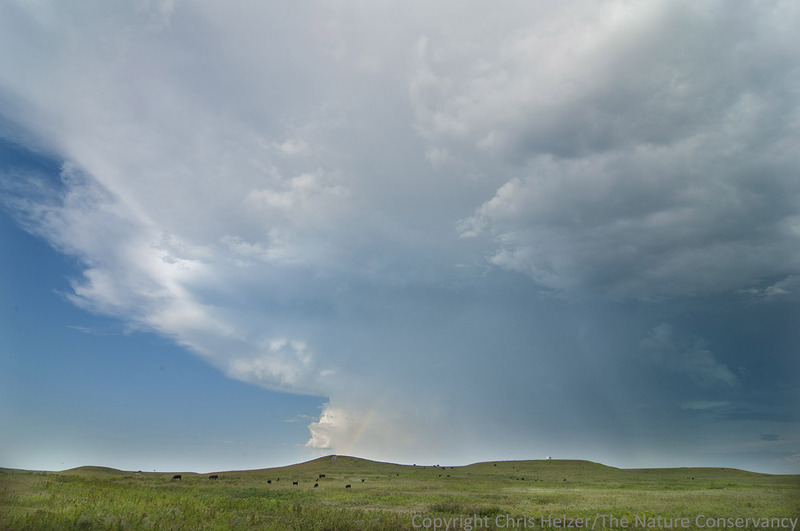 The Flint Hills prairie in Kansas is named for the shallow layers of bedrock beneath the surface. 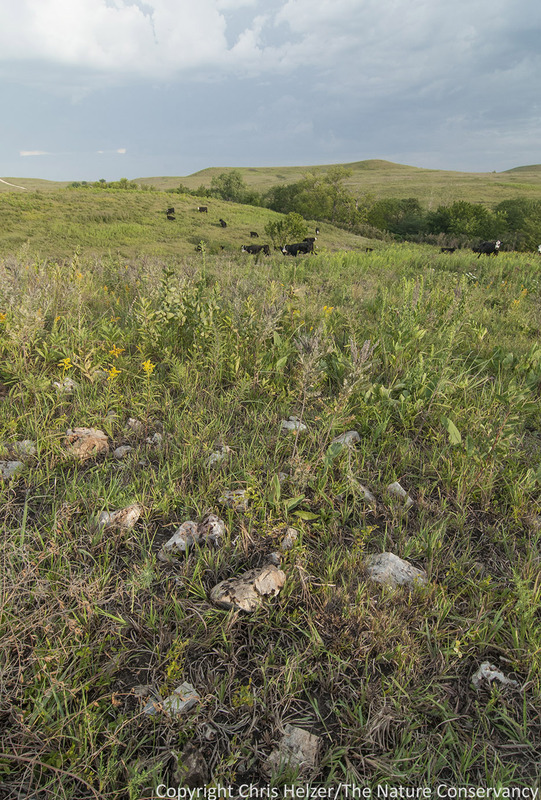 There are also many scattered rocks in the prairie that are easy to see after a fire or grazing event opens up the vegetation. The tour group included (from left) Dillon Blankenship, Jesse Nippert (KSU), John Blair (KSU), Jasmine Cutter, Nelson Winkel, and Tony Joern (KSU). By the time Tony, John, and Jesse headed back to campus, we were ready to head home – not because it was hot (it was) or because we were hungry (we were), but because we didn’t feel like we could cram any more new information into our heads. As I said at the beginning of this post, I’ll try to synthesize some of that information for you over the next couple of weeks, but I’ll also try to put it into small manageable doses. 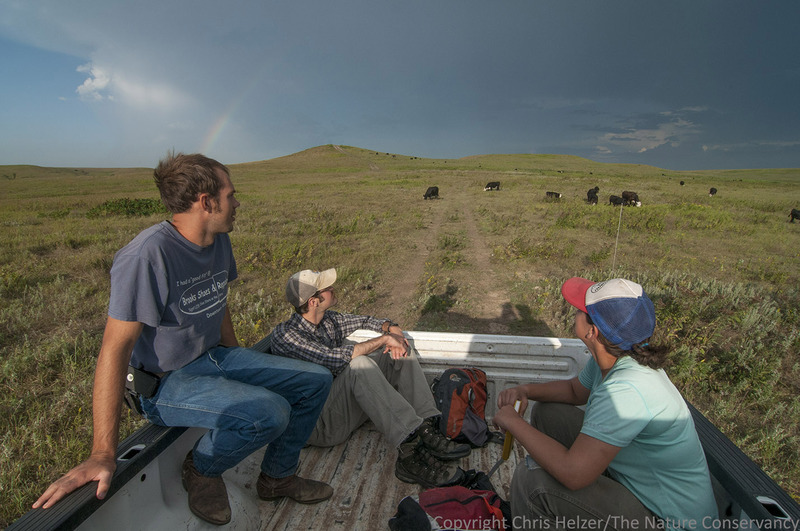 Nelson and the Hubbard Fellows enjoy a rainbow over the prairie. Earth, sky, plants, and grazers at Konza Prairie. 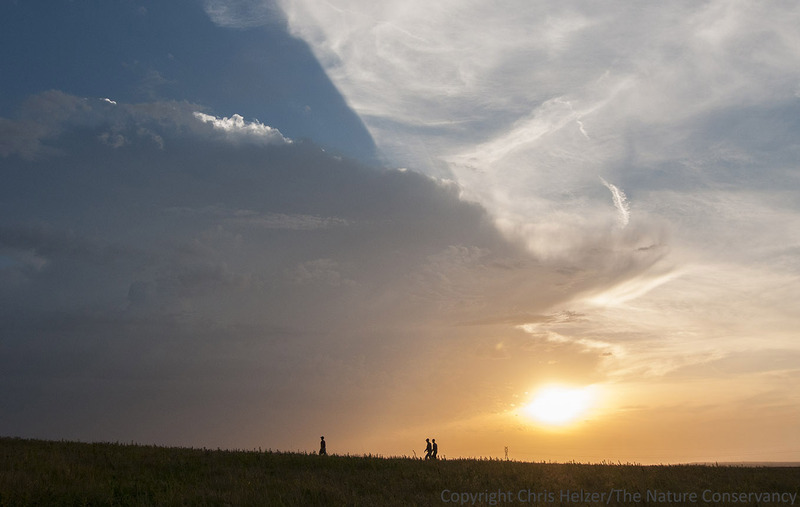 This entry was posted in General, Hubbard Fellowship, Prairie Management, Prairie Natural History, Prairie Photography and tagged grassland, kansas state university, konza prairie, research, tallgrass prairie by Chris Helzer. Bookmark the permalink. These are spectacular photos. Obviously I love the group photo, but also the one from the truck bed with the sneaky rainbow. FUN……..great pictures and story. Good Work People ! Never heard that bison might be better than cattle at controlling cedar. I’ll look forward to hearing that story! The work at Konza completely changed my understanding of the effects of management decisions on prairies. I realized much of what I had been told by people was incorrect. When management activities occurred in local Illinois restorations, I began seeing changes that were predicted by the science that had occurred at Konza. The predictions held true even though Konza is on the near opposite side of the prairie biome from my location. And about bison helping keep cedar trees out of prairies, I recall previously mention that I had observed bison were killing trees. Deer also help remove cedar trees. Deer like to use cedar to rub the felt off their antlers and they also use cedar as a winter browse. awesome opportunity to ride along with you. Looking forward to more details. CATTLE SHOULD NEVER BE ON A TALLGRASS PRAIRIE PRESERVE IN KANSAS OR ANYWHERE! CATTLE ARE NATIVES OF SPAIN, FOR HEAVENS’ SAKE! CATTLE KILL GRASS AND ARE JUST WRONG. WE WHITE EUROPEANS HAVE HAD TO LEARN THE HARD WAY. FIRST WE SAW THE PRAIRIES AS CROPLAND AND BEEF LAND, (THE SOD HAD TO BE BROKEN! AND SO LOOK WHAT WE HAVE NOW!!! TRY LEARNING FROM NATIVE AMERICANS WHO KEPT THE PRAIRIE INTACT FOR THOUSANDS OF YEARS. I’m guessing by the ALL CAPITAL LETTERS and your profile name that discussion is not what you’re looking for here. However, I disagree with you. Cattle do not “kill grass”. Overgrazing can cause problems, of course, just as any other poor management can. On the other hand, there are abundant examples of grazing being used as a positive management tool in grasslands, promoting both habitat diversity and overall biological diversity. You are free to dislike cattle, but I hope you’ll someday look beyond your initial impression and explore the issue further. 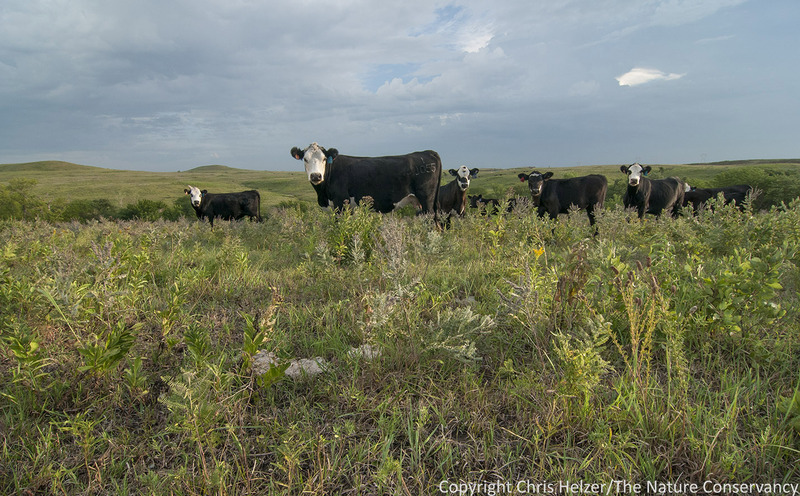 You can find examples on this blog site (search for “grazing”) of very data-driven analysis of the positive aspects of grazing, or I’d invite you to visit the Nebraska Sandhills as an example of a very healthy and diverse grassland that is almost exclusively private ranchland. Thanks for sharing your thoughts.